What is it? – Kingdom Crusher is a strategy-based defense game where you’ll need to defend the King from bombardment in various settings around his kingdom. Who made it? – The game was developed by SinisterSea, with art by Super Flash Bros.
How does it play? – Kingdom Crusher is basically a much-improved version of the gameplay delivered in one of SinisterSea’s other games, Avalancher. This time around, you’ll be protecting a funny little king from catapults, trebuchets, dragons, and more. 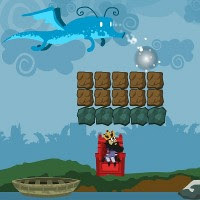 The game consists of 20 levels, spread across four distinct regions of the kingdom. At the start of each level, you place the King in a suitable location, and then build fortifications around him using a limited number of blocks. You’ll begin only with wood blocks, but the money you earn by surviving can be spent on different materials like mud or stone, with each substance interacting differently to the various incoming projectiles. If you can keep the King from losing all of his health until the timer runs out, you get to proceed. The less damage the King takes, the more money you’ll receive. Presentation – The game sports a very clean, pleasant cell-shaded look. The sound effects and music are also well done – if the king is knocked off the map, the ensuing “NOOOoooo!” is definitely smirk-worthy. The background-type also changes every 5 levels, adding some visual variety. Positives – Despite some levels that almost demand trial-and-error, Kingdom Crusher is a fairly easy and relaxing game, without ever really becoming a total pushover. The variety of levels and enemies is also refreshing, and the inclusion of different barricade materials adds another layer of depth. Negatives – The game is solid fun, although I did experience a few King-placement issues where I had trouble distinguishing the solid terrain from the background art. The ability to reset a level once it’s hopeless (instead of having to watch it play out) would also have been nice. Why you should play it – Kingdom Crusher is relaxing, strategic fun, and surviving some of the more tense levels can be very rewarding. It may sound odd, but being under siege is a refreshing change of pace when most similar games put you on offense.